[T]he farmer living far inland...not only gets out wood to burn, but ship-timber. It was he who decided the destiny [of] some mighty oak, that it should become the keel of a famous ship. It is he who says, "Ye shall become ships to plow the sea," when he says, "Ye shall become money to me." ...He burns the hewings in his ample fireplace [and] teams the rest to Medford with the same yokes that plow his fields, Journal, January 14, 1853. Join the Medford Historical Society. Learn more about Isaac Royall, a Medford slave-owner who helped to establish Harvard Law School. Visit the Royall House and Slave Quarters in Medford. Join the Friends of the Fells to preserve Middlesex Fells Reservation. We have scant information about the circumstances of the lecture on "Economy" that Thoreau delivered in Medford on January 22, 1851. 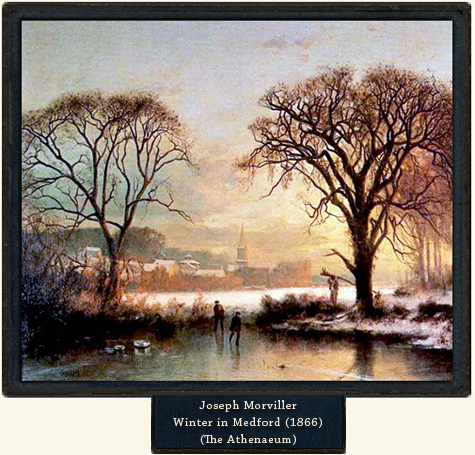 He had given an earlier version of the lecture in Salem in 1848 titled "Student Life in New England, Its Economy," and apparently continued to revise it for publication as the first chapter of Walden, which appeared in 1854. "Medford early adopted the prevalent system; and, for several years, has enjoyed, through the winter, a weekly lecture from the circle of favorite orators. The Town Hall has been filled, and the most friendly feelings promoted. As each itinerant lecturer prepares but one address in a year, he selects the most engrossing topic; and then, with great study, condenses into one hour all the philosophy, wit, and pathos he can command. The pyrotechnic batteries of thought are loaded with surpassing skill. The consequence is, that the assembly is kept at the highest point of intellectual excitement during the time of the address. Thus an extraordinary standard of public speaking is erected, which the Sunday congregation applies with fatal injustice to the one hundred and six sermons which the stated preacher is annually compelled to bring before the same audience." In addition to its flourishing lyceum, Medford boasted an exceptionally active circle of abolitionists, including some who joined Thoreau in supporting John Brown's raid at Harper's Ferry, Virginia. Of these Medford militants, perhaps the most prominent was George L. Stearns, a prosperous industrialist who helped to procure the pikes and rifles that Brown and his small band used in their unsuccessful assault on the federal arsenal at Harper's Ferry in 1859. Stearns fled to Canada immediately after Brown was taken into federal custody, as did other supporters or suspected supporters such as Frederick Douglass. However, on February 24, 1860, less than three months after Brown's execution for treason, in testimony before the Senate Select Committee on the Harper’s Ferry Invasion, Stearns affirmed his view of Brown as a heroic martyr. Asked if he approved of Brown's actions, Stearns replied: "I should have disapproved of it if I had known of it; but I have since changed my opinion; I believe John Brown to be the representative man of this century, as Washington was of the last -- the Harper's Ferry affair, and the capacity shown by the Italians for self-government, the great events of this age. One will free Europe, and the other America." 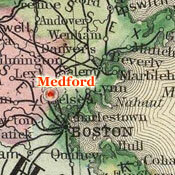 Medford was also home to Lydia Maria Child, one of the most widely read abolitionists of the era. In contrast to Stearns, who shared Thoreau's conviction that slavery itself was more violent than forcible measures against it, Child advocated pacifist approaches to abolitionism. However, after Brown's capture, she joined other pacifists, or "non-resisters," in expressing solidarity with his objectives. 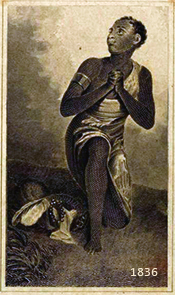 In a letter to Brown in prison in 1859, Child declared, "Believing in peace principles, I cannot sympathize with the method you chose to advance the cause of freedom. But I honor your generous intentions--I admire your courage, moral and physical. I reverence you for the humanity which tempered your zeal. I sympathize with you in your cruel bereavement, your sufferings, and your wrongs. In brief, I love you and bless you." 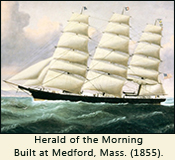 Learn about Medford's Thatcher Magoun & Sons, one of the most successful shipping companies in the U.S. during the 19th century. 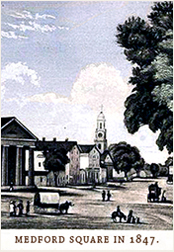 Read A History of the Town of Medford, Middlesex County, Massachusetts, from its First Settlement in 1630 to 1855, by Charles Brooks. Read An Appeal in Favor of that Class of Americans Called Africans (1836), by Medford's Lydia Maria Child. 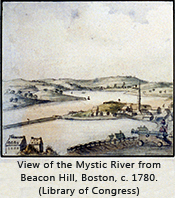 Support the Mystic River Watershed Association. 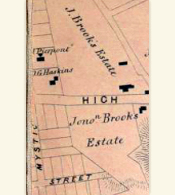 Visit the Brooks Estate in Medford , settled circa 1660.